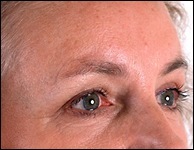 Eyelid surgery or brow lift? When someone complains of the appearance of the upper eyelids, the first thing we do is evaluate whether the problem is excess skin in the upper eyelids, or if the problem is that the eyebrows have lowered in position over time. If the eyebrows are in good position, then we can perform the upper eyelid surgery (also called a blepharoplasty) to remove the excess skin. If the eyebrows are particularly low, however, it might not be wise to excise skin from the upper eyelids, and in that case a brow lift is the better idea. If you look in the mirror and with your fingers raise your eyebrows sky high, you'll see that all of the excess skin in your upper eyelids appears to disappear when the brows are elevated. 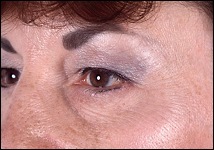 If the brows are low, raising them can take care of much of the problem of excess skin in the upper lids. A couple of examples will help here. In the person pictured below, the before picture shows lots of excess skin in the upper lids. 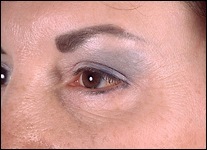 She had a brow lift, not an upper eyelid blepharoplasty. In the after picture, there seems to be very little excess in the upper lids. The woman pictured below has eyebrows that are in excellent position, so the excess in her upper lids can be addressed with just the upper eyelid surgery. The woman below has what seems to be lots of excess skin in her upper eyelids, but her brows are so low that if we were to just work on her upper lids, the result would be poor. If you can imagine only taking excess skin out of her upper eyelids, you'd see that we would just about be sewing her upper eyelashes to the bottom of her eyebrows. She had a brow lift only. Remember, also, that the purpose of the brow lift or forehead lift is only to elevate, vertically, the position of the eyebrows. It does not tighten the forehead skin or remove forehead wrinkles.